Queensland will win games and series in coming years, but the core group of sensational players that gave them a decade of dominance are almost entirely gone. Let’s celebrate the players who produced the greatest streak in rugby league in over 50 years. Set out below in reverse order are the 21 most influential players of Queensland Origin, from 2006 to 2017. A recent addition to the Queensland team, Maguire has provided starch in the middle since 2015. Maguire made this list due to being named the Maroons’ player of the series in 2017, playing a large part in their come from behind triumph. Lasting memory: Replacing Justin Hodges as the resident grub. ‘Special K’. The child prodigy who became a professional code-hopper with questionable recreational habits. From the moment he burst on to the scene for the Brisbane Broncos in 2004, at age 17, Hunt was regarded as something special. He played every game for Brisbane in that rookie year and was picked for Queensland in 2006, at the start of the streak. His only game that year coincided with Queensland stomping on NSW 30-6. In his State of Origin debut, at 19 years of age, Hunt ran with the ball 17 times, making 196 metres. Despite competition from Matt Bowen and a guy called Billy Slater who went alright, Hunt went on to play a significant part in the 2007 and 2008 series wins. In 2008 Hunt played Game 1 at five-eighth, filling in for Darren Lockyer in a losing team. On returning to fullback Queensland won the remaining games to clinch the ‘three-peat’. Hunt was relegated to the bench in 2009 as Slater came into his own. Hunt switched codes in 2010 to become the first NRL player to transition to AFL. Lasting memory: Kamikaze kick returns. Harrison was a physically non-descript player that barely bent the line and did nothing for the highlight reels. As such, he was the perfect successor in a Queensland tradition of players who get the job done and would never have been picked for New South Wales. While being barely noticed, Harrison racked up 15 games for Queensland from 2005-2013. Originally a bit of a playmaker, Harrison became an 80-minute tackling machine. In 2010, Harrison featured in Queensland’s only whitewash series win. Overall, he only experienced defeat three times during the streak. Lasting memory: Tackling some more. See Ashley Harrison above, except that Johnson’s tackles really, really hurt. And he also scored a try. Johnson debuted in 2006 and started at lock for 12 games in a row through to the end of 2009 when he moved to the English Super League. In Game 2 of 2007, Johnson made a record 62 tackles for the match. Lasting memory: Getting knocked out and coming back on the field. A more recent member of the dynasty, Matt Gillett has provided bullocking runs, protection for his halves in defence and a truly remarkable knack for try-saving goal-line tackles. Gillett has played 18 times between 2012 and 2017 and there is no doubt his experience and starch have been severely missed this year. He learned his trade on the interchange bench from 2012 and played 10 of his first 12 games from that position. He graduated to a permanent starting role in 2016 and promptly won man of the match in the first game of that series, won 6-4 in a defensive slugfest by Queensland. Lasting memory: A NSW player is stopped dead in his tracks on the goal-line. With nine tries in nine games, including a hat-trick, Dane Gagai took to Origin like he was born for it. Gagai debuted in Game 3 of 2015 and scored within his first 15 minutes on the field during the 52-6 shellacking. Then, in 2016, Gagai scored Queensland’s only try in their 6-4 Game 1 victory, followed by three tries in Game 2 as Queensland took the series. This was the first hat-trick in Origin for over a decade. Lasting memory: A joyful hat trick. A late bloomer, Corey Parker seemed to get better and better as the years wore on the grey hairs multiplied. A tireless metre-eater, Parker was Queensland’s match for Paul Gallen, with the addition of being a prolific off-loader. Parker played 19 games for Queensland stretching over a decade. He played three games from the bench in the pre-streak days of 2004-2005 and then returned after a long break in 2011. He finally won a starting position in 2012. Showing that aged had not wearied him, Parker was man of the match in Game 3 of 2014 and player of the series in 2015, before signing off from Origin after playing the entire 2016 series. The man with the wonky neck was a brilliant straight runner and defensive centre or winger for Queensland from 2002 to 2014. Tate won two man of the match awards from the wing and scored five tries during his Origin career. Tate got his first taste of Origin from the bench in Game 3 of 2002, when a late Queensland try saw them draw the series and retain the Origin trophy. Tate did not taste success in the Origin arena again until his fourth series in 2006, where he produced a man of the match performance in Game 3. His try with ten minutes remaining put Queensland within reach of an epic victory. Tate played all three games in 2006 and 2007, before being replaced by Darius Boyd after Game 1 of 2008. After a terrible period with injuries, Tate returned on the wing for the 2012 series and played the next eight Origins in a row, including a second man of the match performance in the 2013 decider, won 12-10 by the Maroons. Lasting memory: The neck brace and the try in 2006. Darius Boyd is a somewhat controversial figure. His achievements are often diminished because he played outside the greatest centre of his time and was ‘gifted’ a free run to the line for many of his 17 Origin tries. But Boyd had to score those tries and his defensive work over the same period is often overlooked as Queensland always managed to find a way during close games. Boyd debuted in Game 2 of 2008, scored a try on debut and never looked back. From 2008 to 2016 he scored at least one try in every series except 2011. In 2010 he scored in every match of the series. He played his 28 Origin games in succession, which is a fair achievement. In 2016, while filling in at fullback for the injured Billy Slater, Darius Boyd won the Ron McAuliffe medal for Queensland player of the series. Boyd was mistake-free and always grabbed his opportunities, which could be argued was the main difference between the Maroons and Blues teams during this era. Another underrated player, Sam Thaiday did the hard yards, made the hard tackles and ensured he got there as the third man in for 29 matches spanning the entire period of the dynasty. Thaiday started on the bench in 2006, where he played all three matches. After being overlooked in 2007, he returned to the bench in Game 2 of 2008 as Queensland won the final two games to win the series. In 2009, Thaiday graduated to the starting line-up and was man of the match in Game 2 as Queensland wrapped up another series. Thaiday was then Queensland ‘s player of the series in 2010. Sam was a fixture in the side for the next six years until age finally caught up with him in 2017. Lasting memory: The grin as Sam got in the face of another irritated southerner. Justin Hodges was the man NSW loved to hate. Full of niggle and held together with sticky tape and rubber bands, Hodges tormented the Blues from dummy half for 24 games between his nightmare debut in 2002, up to 2015. Hodges scored a try in Game 2 of 2006 as Queensland roared back into contention but, as was often the case, was ruled out of the decider with a torn hamstring. Hodges was always one of the first picked when fit and managed to play 13 in a row from 2012 to his retirement in 2015. A colossus in defence and deceptively fast, Hodges ensured Queensland were a threat on both sides of the park. Lasting memory: The big sidestep from dummy half. After the retirements of Steven Price and Petero Civoniceva, Queensland needed a dominant front rower and they sure got one in Matt Scott. Scott was a Shane Webcke clone who rolled through the middle of the NSW pack for 22 games between 2006 and 2016. A young Scott made his debut in the second row in Game 1 of 2006 but was dropped after that game. He had to wait until Game 3 of 2009 to return to the Origin arena and immediately showed greater presence in the trenches. He took over from Steven Price in 2010 and made his mark as Queensland swept the series that year. His remarkable resilience saw him prop up the scrum for 21 of the next 22 games, before suffering a serious knee injury in 2017. There is no doubt that a fit and firing Matt Scott has been sorely missed in 2018. Somewhat controversially, I don’t have Cooper Cronk higher up in the top ten. This is no slight on Cronk, but an indication of the riches Queensland have been blessed with over the last 12 years. In 2012, Cooper Cronk had the task of following the legendary Darren Lockyer in the Origin arena. If NSW thought Lockyer’s exit gave them hope, Cronk put paid to that in his first series ‘in charge’ by kicking the series-winning field goal to keep the streak alive. It is a testament to the dedication and skills of Cronk that Queensland did not lose a single series until he was missing with a broken arm in 2014. And now Queensland have lost again after his retirement. Truly a winner. Possibly the most organised and consistent player of his time, Cronk was part of the ‘Big 3′ from 2012 to 2017, after serving in his first two series as an impact player from the bench. Amazingly, Cronk never won a man of the match award, let alone a player of the series, despite being the metronomic heartbeat of this champion side. Lasting memories: Last minute field goals. Barking instructions. In his first few series, my friends called him ‘the legendary Steven Price’, meaning no one had ever heard of him. Playing for Queensland from 1998 to 2009, he saw his share of victory and heartbreak before becoming one of the cornerstones of a pack that gave the ‘future immortals’ space to do their thing. Price’s debut Origin series was a winning one in 1998, where he got to see the work of Shane Webcke up close from the interchange bench. Queensland managed to draw the series in 1999, with Price again on the bench for all three games. Price was then part of the infamous 2000 series, where he was dropped from the team before the Game 3 56-16 thrashing by the Blues. Price was a victim of the clean out after that series and did not play for Queensland again until 2003, which unfortunately coincided with a three series streak by NSW. Price did earn the man of the match award in Queensland’s win in Game 1 of 2005. By 2006, Price was among many players who were likely on their last chance. But the tide turned on a Darren Lockyer last-minute try and Price became a fixture in the front row with Petero Civoniceva for the next four years, retiring in 2009. The definition of an unsung hero. The man with the biggest head in the business snared one player of the series, two Queensland player of the series and one man of the match award, all while doing the dirty work in the middle that makes no highlight reels. Myles was the glue that held the Queensland dynasty together. His Queensland career coincided with the dynasty perfectly – 2006 to 2017. Myles started primarily from the bench from 2006 to 2009 and graduated to the starting line up after the retirement of Dallas Johnson. He started in 21 of the next 22 Origins until tired legs led to him being dropped after Game 1 of 2017. Myles won the player of the series (and Queensland player of the series) in 2012, where he was also man of the match for Game 1. He was again voted Queensland’s best in the losing 2014 series. Lasting memory: Paul Gallen’s fists bouncing off Myles’ impervious head. Greg Inglis has been a colossus. Arguably the most talented player of his generation, Inglis has matured from explosive winger, to unstoppable try scorer, to Darius Boyd’s best friend, to barnstorming fullback and now to the last man standing of the golden era. He has terrorised defences from 2006 to 2018. The player the Blues feared the most, my memories of Inglis are often of him being kept quiet in Game 1. Then the negative press would start. You just knew what would happen next. The fend, the swerve, the trample, the arm free and Queensland would be in again. Inglis scored two tries on debut in 2006 and then was promptly injured, but returned for another double in Game 1 of 2007. By the time the 2007 series was won, Inglis had five tries in three games on the wing. Moving to the centres, Inglis had a quiet game in Game 1 of 2008, and was outpointed by Mark Gasnier. He responded with a man of the match performance in Game 2, setting up two tries for Darius Boyd, a recurring theme in years to come. Inglis was back scoring tries by himself in 2009, and won player of the series. 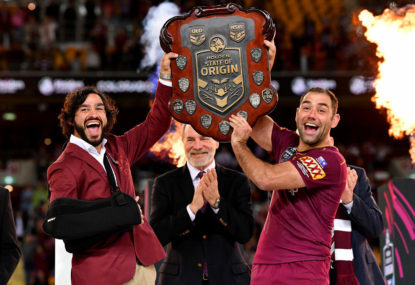 Inglis’ dominated the Origin arena from there up to 2016. It was a rare game where no tries were scored down Queensland’s left side, through Inglis, Boyd or both. Inglis also successfully filled in at fullback for Billy Slater when required. Inglis suffered a severe injury in 2017, ruling him out of the series. He has returned in 2018 to lead the side in the absence of the other retiring stars. Despite losing some pace after serious injury, Inglis has made more post contact metres over the first two games than any other player on the field. Lasting memories: The fend and the goanna. The rock that built the dynasty. Petero was the hardest man of his era while being a complete gentleman. Tough as nails and incredibly durable, the Redcliffe boy holds the record for most Origin games by a forward. Like Steve Price, Civoniceva played for some years prior to the streak, starting his origin career in 2001. He endured the lean years from 2003 to 2005 and was another who was likely on his way out if Queensland had not conjured a last-minute victory in 2006. In partnership, firstly with Steve Price and then with Matt Scott, the big Fijian dominated the middle in the toughest football arena. From 2006 to 2012 he only missed two games. Civoniceva was named Queensland’s player of the year in 2008 and in 2011. Lasting memory: Charging at the line and players bouncing away. No longer ‘Billy the Kid’, Slater is now generally considered to be the finest fullback since Clive Churchill and the hardest working player in the game. No one has ever covered more ground than Slater. Slater drove NSW kickers to distraction as no matter how they tried they always seemed to kick it to him on the full. Slater is the master of the sweep play at speed and has unparalleled game awareness. Slater first played Origin in 2004 and, although Queensland were on the wrong end of the scoreline, Slater produced one of the most replayed tries in history, gathering a Lockyer chip kick and then chipping himself while wrong-footing the NSW fullback to score. He was man of the match and a star was born. But it took some time for Slater to cement his place in his preferred fullback position. 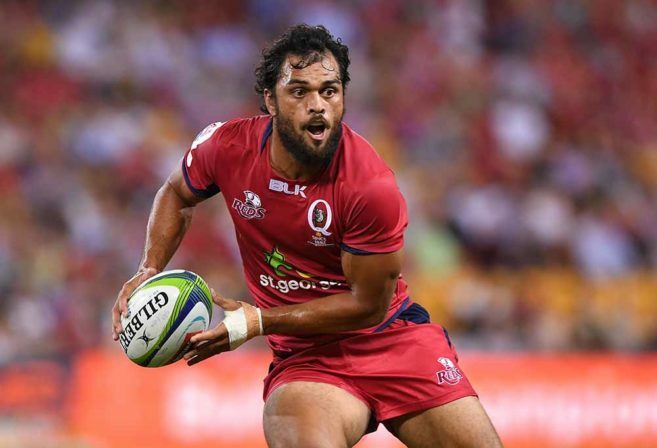 He had Karmichael Hunt ahead of him, whose bigger body was considered more suited to Origin, and injuries and suspensions meant he was not in the side for the 2006 or 2007 series. Slater finally started a full series at fullback in 2009, and this coincided with a period of even higher dominance as Queensland won six of the next seven games. Slater took man of the match honours in Game 3 of 2010 and player of the series that year. A measure of Slater’s value is how Queensland have tended to struggle without him in the first games of each of the past two years. Despite the emergence of Kaylan Ponga, Slater’s presence will be sorely missed from 2019. Lasting memory: You could say that try, but it was pre-dynasty, so let’s go with catching the ball on the full and making Mitchell Pearce cry, or sweeping around the back at pace. Darren Lockyer was three minutes away from being punted from Origin when he pounced on a loose ball and willed himself over to win the Origin series in 2006. Lockyer had started his career as a brilliant fullback, full of pace, swerve and balance, but by 2006 he had moved to No. 6 and the knives were out after the loss in Game 1. Lockyer was man of the match as Queensland ripped NSW apart 30-6 in Game 2, and then in Game 3 he iced the game. By the end of that year, Lockyer had captained a winning Origin series, been award player of the series, won a premiership and become the only player to win the Golden Boot as best player on the planet in two different positions. Lockyer had already had a stellar career by this point, winning three premierships with Brisbane, and playing for Queensland and Australia since 1997. He had been part of the Queensland side that had held the trophy for four years out of five from 1998 to 2002 (albeit through two drawn series). He had been captain of Queensland since taking over from Gorden Tallis in 2001 and was man of the match in the series decider that year. He had been Queensland ‘s player of the series in 2001 and 2003. But it was by driving his side over the line in 2006 that Lockyer made himself a Queensland legend. Lockyer captained his side to victory again in 2007. By 2008 Lockyer’s team managed to win without him while he recuperated from a serious injury – giving us a glimpse of Cameron Smith’s leadership abilities. Lockyer was back to lead his side to victory in 2009 through 2011, before passing the baton on the Cameron Smith. 36 games in a row. 234 points. five man of the match awards. The Show and Go. Clutch conversions with a shoulder destroyed. What more is there to say about Johnathan Thurston? Thurston is the ultimate competitor. To play that many Origin games in a row, while generally being the smallest on the field, targeted by opposition forwards and taking the ball right to the line time and time again, is a miracle. 2008 was one of many highlight years. Without Lockyer beside him for the first time, Thurston won player of the series and engineered the series-winning try for Billy Slater with one of his patented show and go line breaks. And then there was his final game, where he kicked the winning goal from the sideline with a wrecked shoulder to keep Queensland in the series. Was there ever any doubt? Lasting memory: The final kick. It had to be Smith, the winningest winner to ever win. The Accountant. The Referee Whisperer. The Leader. Smith learned the ropes under Darren Lockyer and then took his team to continued success. He has the best game management skills since Wally Lewis, an amazing engine, a sharp running game, an error-free passing game, and a deadly kicking game. The durability of the man, to top the tackle count virtually every time, while still running the game for his team for well over a decade, is unmatched. Smith came into the team in 2003, with Queensland outmatched for the next three years. But those years saw Smith hone his club combination with Billy Slater, Greg Inglis and Israel Folau, and his representative combination with Darren Lockyer and Johnathan Thurston. By 2006, Smith was on top of his game and he made the Origin stage his own over the next 12 years. Seven man of the match awards (second only to Lewis) and four player of the series awards says it all. From the time he was first picked for Game 3 of 2003, Smith missed only one game. The ultimate influence on the greatest team in a generation. Lasting memory: 2017 game three, with NSW in with a genuine chance, Smith comes out and blows them away in the perfect half of football.